Constellation Cepheus the King, is a northern constellation sitting above Cassiopiea constellation, between Ursa Minor and Cygnus. Cepheus spans 60 degrees of the Zodiac in the Signs Pisces, Aries, Taurus and Gemini, and contains 13 named fixed stars. Cepheus, King of Æthiopia, was taken into heaven with his wife Cassiopeia and daughter Andromeda in commemoration of the deeds of Perseus. 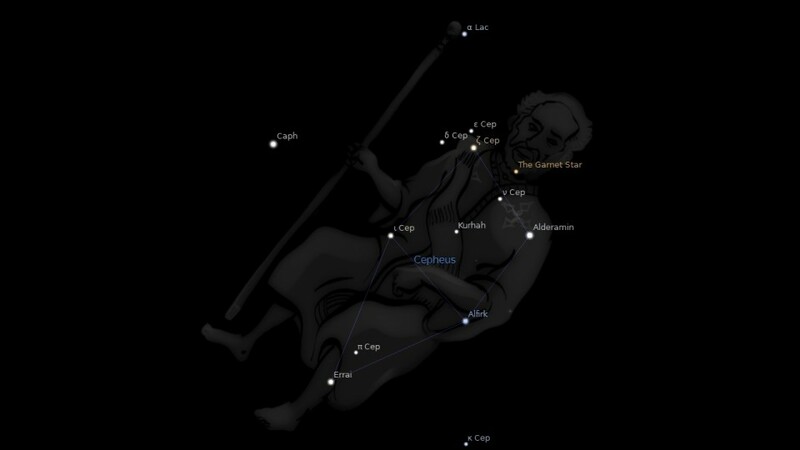 Cepheus is an inconspicuous constellation, but evidently was highly regarded in early times as the father of the Royal Family, and his story well known in Greek literature of the 5th century before Christ. The name Kepheus compared by Brown to Khufu of Great Pyramid fame, was the source of many queer titles from errors in Arabic transcription — first into Kifaus, Kikaus, Kankaus; later into Fikaus, Fifaus, and Ficares, or Phicares, its usual designation in Persia, and Phicarus. Chilmead suggested that Phicares was a Phoenician title equivalent to Flammiger, and identical with Purkaeus, the Fire-kindler, which, transliterated as Pirchaeus, has been used for these stars. Later on in astronomical literature we find Caicans, Ceginus, Ceichius, Chegnius, Chegninus, Cheguinus, and Chiphus, some of which also are seen for Bootes. 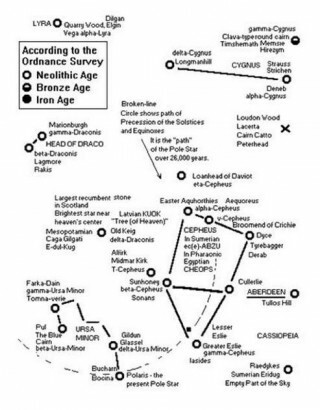 The later Hindus knew Cepheus as Capuja, adopted from Greece; but Hewitt claims that with their prehistoric ancestors it represented Kapi, the Ape-God, when its stars alpha (Alderamin) and gamma (Alrai) were the respective pole-stars of 21,000 and 19,000 B.C. Cepheus will not engender dispositions inclined to sport. He fashions faces marked by a stern demeanor, and moulds a countenance whereon is depicted gravity of mind. Such men will live on worry and will incessantly recall the traditions of a bygone age and commend old Cato’s maxims. Cepheus will also create a man to bring up boys of tender age he will lord it over his lord [dominum dominus] by virtue of the law which governs a minor and, bemused by this semblance of power, will mistake for reality the role of arrogant guardian or stern uncle which he plays. Offspring of Cepheus will also furnish words for the buskin of tragedy whose pen, if only on paper, is drenched in blood; and the paper, no less will revel in the spectacle of crime and catastrophe in human affairs. They will delight to tell of scarce one burial accorded three. The father belching forth the flesh of his sons, the sun fled in horror, and the darkness of a cloudless day; they will delight to narrate the Theban war between a mother’s issue and one who was both father and brother to his children; the story of Medea’s sons, her brother and her father, the gift which was first robe and then consuming flame, the escape by air, and youth reborn from fire. A thousand other scenes from the past will they include in their plays and perhaps Cepheus himself will also be brought upon the stage. If anyone is born with the urge to write in lighter vein, he will compose for presentation at the merry games scenes of comedy about the loves of headstrong youths and abducted maidens, hood-winked old men, and slaves of infinite resource. In such plays Menander made his own day live for all generations: a man whose eloquence surpassed that of his native Athens, he held up a mirror to life and enshrined the image in his works. Should his powers not rise to such masterpieces, the child of Cepheus will yet be fitted to perform those of others he will interpret the poet’s words, now by his voice, now by silent gesture and expression, and the lines he declaims he will make his own. Here we have the presentation of a glorious king, crowned, and enthroned in the highest heaven, with a sceptre in his hand, and his foot planted on the very Polar Star itself. His name in the Denderah Zodiac is Pe-ku-hor, which means this one cometh to rule. The Greek name by which he is now known, Cepheus, is from the Hebrew, and means the branch, and is called by EURIPIDES the king. An old Ethiopian name was Hyk, a king. There are 35 stars, viz., three of the 3rd magnitude, seven of the 4th, etc. The brightest star, a (in the right shoulder), is called Al Deramin, which means coming quickly. The next, b (in the girdle), is named Al Phirk (Arabic), the Redeemer. The next g (in the left knee), is called Al Rai, which means who bruises or breaks. Geographic placements of megaliths were intentionally oriented to the heavens in a given era. For Neolithic sites, the cardinal calendric date seems to be December 25, 3117 BC (-3116 by astronomy) when eclipses involving the conjunction of the Sun, Moon and Jupiter occurred at the “boat” of Capricorn. This unique phenomenon was well suited to start the first long-term human calendar-retained in e.g. Hindu and Maya calendration. We will show that this calendric beginning was marked on Earth in earthworks near Lewes, England, and elsewhere on the British Isles. WHO WAS BEHIND THE MEGALITHIC SYSTEM? A number of megaliths show a singular sculpting style of absolute genius, perhaps from one artist, who we call Merlin, presumably residing anciently at Kents Cavern. We equate Merlin with the legendary physician Aesculapius of the fabled Argo of Jason and the Argonauts (argos=e arth) whose Minyans we hold to be the first men to ever conduct a geodetic survey of Earth by astronomy. “Merlin” as a legendary name perhaps goes back to the root MER-meaning “measure, survey” in ancient Indo-European , e.g. Latvian, a language which has lexical ties to Gaelic: see MacBainrs Dictionary online at Gaelic Languages Info. We will allege-speculatively, of course-that Merlin was buried at Paviiand as the first modern scientist (“sorcerer” or “shaman”) and that his exploits are also recorded in Pharaonic Egypt as Narmer (measurer mer of earth and heaven Nahr) and that his contemporary follower King Orry, buried on the Isle of Man, is probably the fabled King Arthur of legend, known-by our analysis-as Hor-Aha in Pharaonic Egypt, whose legendary in ancient epic and in the heavens as the Argonauts of old. NEOLITHIC SITES IN SCOTLAND NEAR ABERDEEN Representing CEPHEUS and neighbouring stars. The ancient astronomers were Cepheans who made Cepheus the father of their royal family of stars. CEPHEUS in Sumerian Temple Hymns is transcribed as EC-ABZU “shrine which is the abzu” (in Latvian APEJSHU “the go-around”), and in Pharaonic Egypt so designed by the ancient sky surveyors. Cepheus is landmarked by Neolithic sites in Aberdeenshire. The following sites form the shape of the stars of Cepheus. Most site names have ancient comparables star names: Old Keig, Midmar Kirk (Al Firk), Sunhoney (Sonans), Cullerlie, Tyrebagger (Derab), Easter Aquhorthies (Aequoreus), Eslie (Iasides) and Broomend of Crichie (the “broom end” of “sweeping” precession). The stone circle at Old Keig has the largest recumbent stone in all of Scotland, brought from over 10 kilometers away, and requiring at least 100 men to move it, so the ancients had a reason for putting the stone where it is found. Stone circles were not just local sundials. Large fires were burned at the site of Old Keig and Cepheus is known as the “Fire-Kindler”. OLD KEIG may appear in the ancient Sumerian temple hymns transcribed as the similar E-DUL-KUG. This would be Mesopotamian Ca/a Gilgati, delta-Draconis. Fixed Stars and Constellations in Astrology, Vivian E. Robson, 1923, p.37. Star Names: Their Lore and Meaning, Richard H. Allen, 1889, p.154-157. Astronomica, Manilius, 1st century AD, book 5, p.336-341. The Witness of the Stars, E. W. Bullinger, 23. 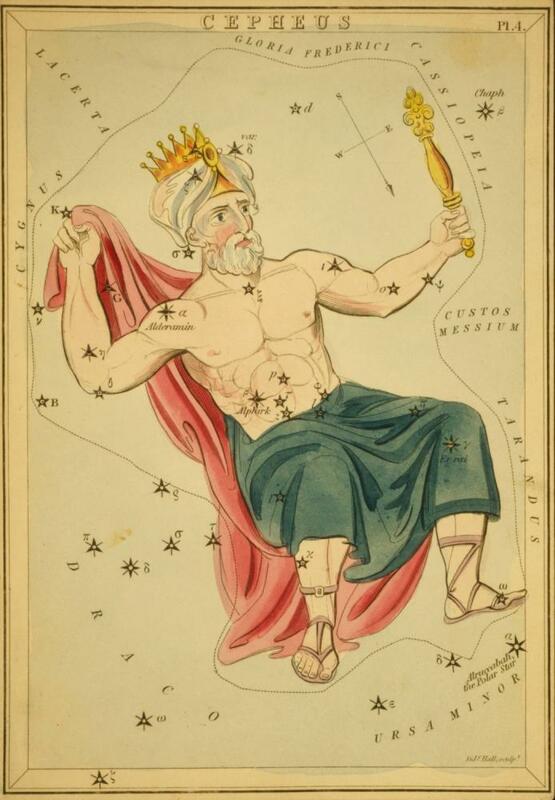 Cepheus (the Crowned King). Stars, Stones and Scholars, Andis Kaulins, 2003, p.19-20, p.57-58. Fixed Stars and Judicial Astrology, George Noonan, 1990, p.12. this is really interesting… thanks for posting the info on the Scottish site, of great interest to me for many reasons… I am currently doing a summary of my astrology combined with astronomy, trying to make it coffee table-ish, it’s still just a sample cos so much to do… I hope to share a copy with Trump for the sake of further seeking to share an environmental perspective and a Scottish perspective with him… at the start I had to work on my pole stars thing, and did my own diagram… kept having to add stars… MY QUESTION THAT PUZZLES ME, WHY IS IOTA CEPHEI A POLE STAR WHEN IT’S WAY FURTHER AWAY THAN ALFIRK BETA CEPHEI (WHICH MISSES OUT)??? IS THERE SOME PREJUDICE IN CULTURE? IS IT THE VARIABILITY? ?